The number of high net worth individuals (HNIs or individuals with investable assets of $1 million or more) in India has grown for the second straight year. India's HNI population grew at 20.8% to 1.53,000 in 2010 compared with 1,26,700 in 2009, according to the 2011 Asia-Pacific Wealth Report by Merrill Lynch Global Wealth Management and Capgemini. 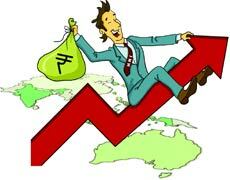 The cumulative wealth of Indian HNIs grew by 22% in 2009-10 to Rs 28,60,000 crore from a year ago. Asia-Pacific's HNI population 2010 has exceeded that of Europe, making it the second largest market after North America. Asia-Pacific's HNI population grew 9.7% to 3.3 million in 2010. Japan remained the largest HNI segment in Asia-Pacific, accounting for 52.5% of the region's HNIs, followed by China (16.1%) and Australia (5.8%).